get yourselves over to the main live text for the latest from the Premier League and Football League. Brentford boss Mark Warburton told Sky Sports: "We're disappointed. We've had heated words in the changing room, we felt we should have won it. To only get the one point is more than frustrating." Fewer shots, efforts on target, corners and less possession. But Brentford didn't take their chances (Andre Gray in particular) and Darren Bent made them pay. Brentford midfielder Toumani Diagouraga told Sky Sports: "I thought we were going to win it. It's heartbreaking. We're still in the race, there's four games to go. Hopefully we can send the gaffer off with a promotion." Derby goal-scorer Darren Bent told Sky Sports: "It's disappointing. It was a big opportunity for us. We have to give credit to Brentford. All we can do is keep going forward and keep trying to win games." There are a few promotion clashes in League Two today. Leaders Burton go to play-off chasers Luton, while seventh-placed Newport are at home to Bury, who are fourth. Second-placed Shrewsbury are at home to Exeter, who are only one point off the play-offs. Stevenage - in sixth - play Northampton, who are five points off the top seven. There are tough games for the two clubs in the Football League relegation zone. Bottom-place Cheltenham go to Wycombe, who are third, and Tranmere go to fifth-placed Southend. Hartlepool, who are one point above Tranmere, go to York - who are only six clear of the relegation zone themselves. Mansfield - who are also six clear - visit eighth-placed Plymouth. Carlisle, who are also battling relegation, are at home to Dagenham & Redbridge. The three games with nothing riding on them are AFC Wimbledon v Oxford, Cambridge v Accrington and Morecambe v Portsmouth. Leaders Bristol City will be promoted if they beat second-placed Preston, MK Dons lose and Swindon fail to win. Yeovil will be relegated if they fail to beat Notts County, who are also in the bottom four. The frankly ridiculously close relegation battle in League One means every game has something riding on it. Fifteen-placed Walsall - who host play-off chasers Fleetwood - are only two points above the relegation zone. Coventry, in 17th, host 23rd-place Colchester, who would overtake their hosts with a two-goal win. Other all-relegation battles are Crewe v Leyton Orient and Scunthorpe v Crawley. Port Vale, two points above the drop zone, host promotion-chasing MK Dons. At the other end of the table, fourth-placed Swindon play Peterborough, who are six points off the top six, and Barnsley - seven points off - host sixth-placed Chesterfield. Seventh-placed Rochdale go to mid-table Doncaster. The game with the least riding on it is Gillingham (six points above the relegation zone) v Bradford (six points off the play-offs). Five of the eight promotion-chasing Championship teams are in action in the 15:00 BST kick-offs today. Play-off chasers Wolves face the very short trip to St Andrew's to play Birmingham. Norwich go to Bolton and Ipswich host already relegated Blackpool. Middlesbrough host Rotherham, who are not 100% safe yet - sitting seven points above the drop zone. And Watford go to almost-relegated Millwall, who are one of the teams the Millers are seven points above. (a game which away fans are boycotting in a tickets argument), Nottingham Forest v Huddersfield, Reading v Blackburn and Sheffield Wednesday v Charlton. main football live text commentary. So Derby remain fifth with the draw, and Brentford move up one position to sixth. Wolves are behind the Bees on goal difference, with Ipswich three points back. And that's that. The Rams remain above the Bees in the table with a fortunate draw. "You knew Brentford hadn't put the game to bed and Derby have come back. Darren Bent struggled to control it and took three touches - it sums up their day. But it's a good finish in the end. To get a point from it will feel like a win." So harsh on Brentford but they should have taken their chances. The ball breaks to Jeff Hendrick 30 yards from goal, it looks like he's going to shoot but instead he plays the ball in to Darren Bent, who controls it and fires home from close range. A huge goal in the promotion race. Four minutes added on. But Derby don't look like they're going to equalise. Brentford just keeping the ball in the corner. But Stuart Dallas overruns it and Derby get a throw-in. But they lose it straight away. Poor performance by the Rams. They just can't clear their lines, let alone set up an attack. Brentford have most of the ball, they're keeping it as far away from their goal as they can. Tommy Smith takes the ball into the corner and Derby midfielder Jeff Hendrick comes in with a crunching tackle. Yellow card. Alex Pritchard - the match-winner as things stand - is replaced by Jon Toral, the final change of the game. Derby defender Zak Whitbread almost equalises as he flicks a corner goalwards but David Button is able to parry it over - would have been against the run of play. The Rams lose the ball and Tommy Smith wins a free-kick at the other end of the pitch. The Bees will take their time now. Brentford make a change - Tommy Smith comes on against his old club. Andre Gray - who has had a poor day in front of goal - is the man to be replaced. Zak Whitbread's first involvement is a good block from Alex Pritchard on the edge of the box. That's the Bees' 17th shot. Derby have had five. Nine minutes to go. Derby make a double change here - Zak Whitbread on for Stephen Warnock in defence and Manchester United loanee Jesse Lingard replaces Craig Bryson in the attacking end of the pitch. "Brentford have been brave in possession and kept the ball. They've created more chances than probably anyone else who has come here. They are where they are in the table on merit." If Derby end up getting something out of this, Andre Gray won't sleep well tonight. The summer signing from Luton has scored three goals in his last five games, but doesn't look high on confidence today. "Steve McClaren has had this wrong from the start. Brentford have been far the better side. You don't see this happen to Derby - it's down to a change in system. It's all over the place in the second half." Derby defender Raul Albentosa is fit to continue. Brentford break into the box but Stephen Warnock puts in a potentially goal-saving tackle. Derby counter but Tom Ince gets his ball through to Darren Bent wrong. Moments later Brentford are back attacking - Stuart Dallas crosses to Andre Gray who heads over from six yards out. He could have had a hat-trick - he has zero goals. Andre Gray has an air-shot at one end, and Derby break in numbers. Chris Martin tries to play the ball across from Darren Bent but even Usain Bolt would have struggled to get on the end of it. Derby defender Raul Albentosa looks injured from his role in trying to block Gray's initial chance. Setting up that chance was Jota's last action of the game - the Spaniard comes off for fellow midfielder Stuart Dallas. Derby defender Craig Forsyth saves his team here. Jota cuts the ball back to Jonathan Douglas, whose shot is blocked on the line by Forsyth. The ball comes back to Douglas, who tries to get a shot away while sat on the ground but Richard Keogh gets it away. "Last week you would have said Derby were an absolute banker for the top six. You look at them now and would say the exact opposite." Even if they do get there, on this performance you wouldn't fancy their chances in the play-offs. Toumani Diagouraga charges forward for Brentford, he can slip in Andre Gray just outside the box here but he gets the ball horribly wrong, passing it behind his striker rather than in front of his run. Stavros Makrozachopo: The Derby Premier League dream is melting faster than an ice cream in August. Or an ice cream yesterday. Just as I write that Darren Bent almost had a chance. Simon Dawkins, the half-time substitute, slips the Aston Villa loan striker through but Brentford's keeper is as sharp as a Button (David Button) to come out to the edge of his box and smother the ball before Bent can step past him. At the other end, Brentford have a chance but Alex Pritchard's shot is straight at keeper Lee Grant. Derby striker Darren Bent has been doing quite a bit of work outside the box today, a while back he won the ball near his own box and he closed down Harlee Dean there as the Brentford defender tried to clear the ball. Hasn't had many opportunities on goal though. It's all Bees now. Brentford play a corner to Alan Judge just outside the box (the Paul Scholes routine) but his first-time volley from 20 yards is hopelessly off target. Oh Andre Gray has an equally good chance here - it's Jonathan Douglas again who sets it up, this time playing a through-ball to Gray. His first touch should take him away from defender Craig Forsyth but it doesn't. He makes a bit of a mess, the ball stuck in between their legs, and eventually gets a shot in but screws it wide. Oh that's a huge chance. Brentford attack and Derby can't clear - a ball comes in to Jonathan Douglas, who lays it off for Andre Gray eight yards - it looks like it's 2-0 time but Raul Albentosa puts him under enough pressure to deny him. Great defending but Gray probably should have scored. Derby putting together a few passes around midfield but then a long ball forward down the wing just drifts out of play. Poor. "The Derby system is a bit of a mish-mash. I'm not really sure what it is. It looks like two up front with Tom Ince in behind. "Nobody wants to come and link play. Chris Martin wants to play up against someone and that means he and Darren Bent are not getting into the game." Derby start the second half in an attacking mood, spending much of the first couple of minutes near Brentford's box. Derby make a change as Johnny Russell, who hasn't been feeling well today, comes off for fellow forward Simon Dawkins. Derby get the second half going. Brentford deserve their lead - more possession, shots, efforts on target and goals. Here's the top six as it stands (a phrase you'll hear a lot in the coming weeks). Derby only above Wolves on goal difference and Ipswich by three points. "The front two haven't got into the game for Derby. They have to be brave or change the system. "The 4-4-2 doesn't suit them. They either have to push the full-backs forward or take a striker off and play a 4-3-3. At this stage, they are deservedly behind." Derby have the last attack of the first half but Stephen Warnock - a former England international lest we forget - is unable to find Darren Bent in the box. And there goes the half-time whistle. Two minutes of stoppage time. Brentford break again and Alex Pritchard almost has a second goal, unfortunately for him there's a Derby defender in front of him who can block in. Then Jota has a shot but fails to beat keeper Lee Grant. Derby striker Darren Bent tries to get his head onto a cross but misses out by inches. If he'd made contact you feel it'd be 1-1. Craig Bryson is the first Derby player into the book - he fouled Moses Odubajo. Tom Ince drops back to win the ball for Derby near his side's own box and sets up an attack, Johnny Russell breaks forward and wins a corner after unit Toumani Diagouraga steps across to tackle him. The corner comes to nothing. Daniel Woodley: What a strike from Alex Pritchard. This boy just oozes class. Can't wait to see him at Spurs next season! #bbcfootball on Twitter, or you can text us on 81111 in the UK only - but don't forget to include your name and location. Brentford coming forward in numbers since the goal and Richard Keogh throws himself at a Jota shot to deny the Bees a second. At the other end, Tom Ince has his low shot from an angle saved. Moments earlier, Daniel Kelly ‏tweeted us: "A goal is needed in the game between Derby and Brentford, come on you Rams! A draw is not good enough." Now he says: "Well there's the goal, Derby need to wake up, been awful since the 10th minute..."
"Brentford manager Mark Warburton has jumped up and celebrated before it's hit the net. We're right behind it and could see it was going in." Alex Pritchard is on loan at Brentford from Tottenham and he's shown some real Premier League quality there. The midfielder is picked out by Alan Judge on the left wing, he goes on a dribble, cuts inside and curls a wonderful effort home from just outside the box. A long Derby ball comes forward to Johnny Russell and for a second he thinks he's in but the assistant referee raises his flag - very late. The Scot - and Darren Bent - were both well offside after Brentford's line stepped up. Brentford midfielder Alan Judge - who knows his way around a free-kick - steps up but he curls his effort a few inches wide of the post. Brentford whip a ball into the box which James Tarkowski gets onto at the far post, but - under pressure from Richard Keogh - he can only head wide. "This is the kind of game where Derby are unlikely to dominate possession as they're used to, because they're playing a new system. They usually play 4-4-2 or a 4-5-1 but today it's more of a 4-3-3." Brentford have their first chance of the game as Moses Odubajo finds space in the box but his shot is easily saved by keeper Lee Grant. It's been good for a 0-0 so far. Derby want a free-kick as Darren Bent tries to chip the ball past James Tarkowski. It hits his arm but it was down by his side - never a free-kick. Tarkowski runs the ball out of defence but loses steam 15 yards into the Derby half and loses the ball. His team-mate escaped a yellow card moments ago but James Tarkowski doesn't as he shoulder charges Richard Keogh and gets booked for it. Seemed a fair challenge to me. Brentford's Toumani Diagouraga comes in late with a sliding tackle on Tom Ince - if that had happened in the second half, it would have been a yellow card. As it is, the referee just has a word. Ince steps up for the free-kick from 25 yards out and curls it just wide - the first chance of the game. Brentford have the first attack of the game as Alex Pritchard finds left-back Jake Bidwell but he gets his cross horribly wrong and it's a goal-kick. Some good early pressing by Brentford, who force Derby to get the ball back to keeper Lee Grant, who is then put under pressure himself and he boots the ball long to the Bees defence. (10C say our pals at BBC weather). Almost ready to go. Derby boss Steve McClaren on Sky Sports: "Brentford have done magnificently. Mark Warburton has done a brilliant job. This won't be 0-0. It could be an interesting game." Brentford boss Mark Warburton: "We will try to dominate and enjoy our football. If we're below our standards we'll pay the price - the margins are that fine." Will either of these teams be in the Premier League next season? Is Steve McClaren successfully rebuilding his reputation? Will Mark Warburton have his choice of clubs this summer when he's handed his P45 after his impressive work with Brentford, possible back-to-back promotions in his first job? Let us know on Twitter (#bbcfootball) or text 81111. There were a couple of Championship matches last night. Bournemouth edged closer to promotion after second-half goals from Yann Kermorgant and Callum Wilson sealed a 2-0 win over Brighton. They are now four points clear of second and third (who both play games in hand today). In a game moved for the Boat Races, Wigan battled back to earn a 2-2 draw at Fulham but new boss Gary Caldwell was unable to inspire them to a much-needed win in their fight against relegation. Derby are without talented midfielder Will Hughes, who is suspended. Darren Bent and Chris Martin start up front for the Rams. Brentford striker Chris Long misses out with a stomach problem, and captain Jonathan Douglas returns after being rested. 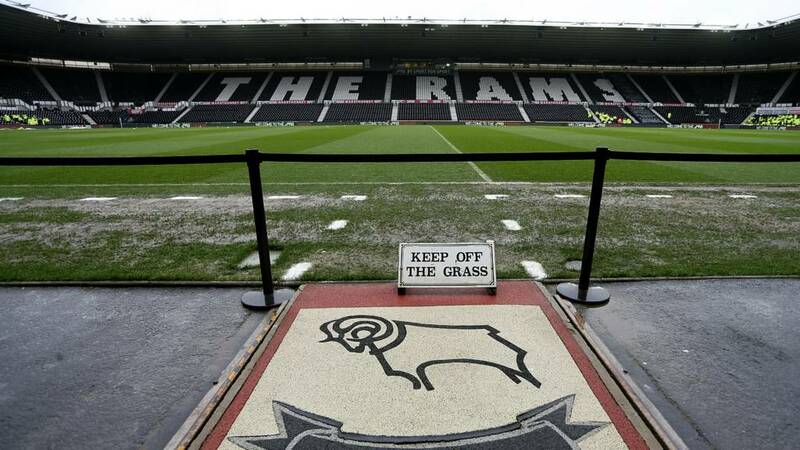 Derby: Grant, Keogh, Albentosa, Forsyth, Warnock, Russell, Bryson, Hendrick, Ince, Bent, Martin. Subs: Dawkins, Ward, Lingard, Whitbread, Roos, Hanson, Thomas. Brentford: Button, Odubajo, Dean, Tarkowski, Bidwell, Douglas, Diagouraga, Jota, Pritchard, Judge, Gray. Subs: Craig, McCormack, Bonham, Toral, Smith, O'Connell, Dallas. Both these clubs enjoyed a decent Easter Monday. Derby beat Wigan 2-0 for their first win in eight games after a decline that saw them drop out of the automatic promotion places. Brentford might not have settled for a 2-2 draw with Nottingham Forest before kick-off but Jota's 95th-minute header was greatly appreciated. Derby start the day in fifth place in the Championship, with Brentford in seventh. A Bees win would see them overtake Derby and move up into the play-off places. A Derby win would take them to within two points of second-placed Norwich, who visit Bolton later today. In one corner, we have a failed England manager trying to rebuild his reputation after falling short in his last three club managerial jobs. In the other, we have a former City trader in his first managerial job trying to lead a relatively small London club to the top flight for the first time since just after World War II. Oh by the way, he's getting the boot even if they get promoted. Just another day in the mad world of the Championship promotion race.